Home / Autism / How to say where it hurts. How to say where it hurts. 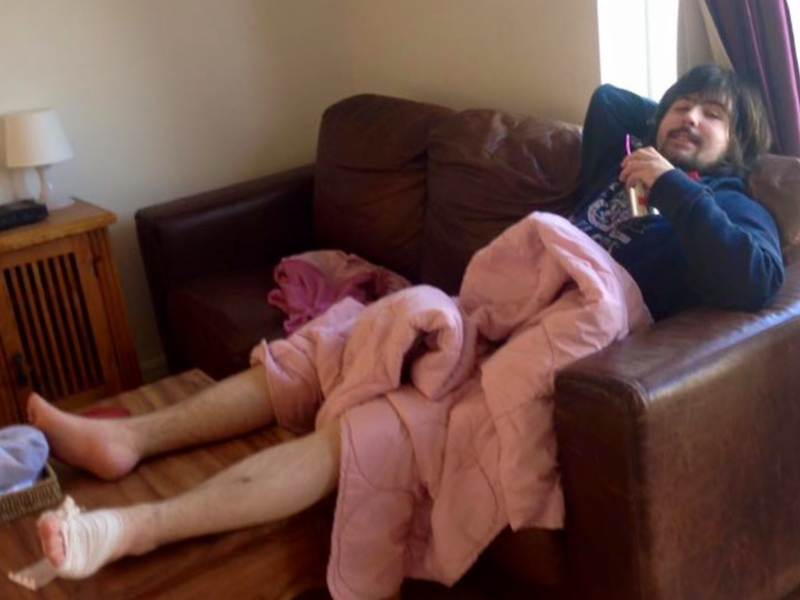 I would take him to the Doctor, get the antibiotics and then fail hopelessly at getting him to take them (because he was so sensitive to taste and smell) so the infection would escalate into something even stronger and more painful. Even with this septic mess of a throat, Boo would continue to run around and play until suddenly he would go pale and listless. Everybody has a different pain threshold, and Autistic people feel pain to the same degree as anyone else. But they can be incredibly stoic and they need to be taught, step by step to ‘act” like they are in pain. You can observe this regularly when flu goes through your house. Mums will grab a box of tissues, take a decongestant and get on with all the chores they usually do. Whereas men tend to develop the dreaded “man-flu” and take to their beds or the couch where we must bring them things until they recover. Acting sick when you are sick gets you attention and help. Not acting sick means you often get sicker. So we have to teach our kids with autism that it is rewarding to tell us when they are in pain. You must do this in context, when they are actually feeling pain. For ethical reasons you have to wait until they trip over or get a bump that you know is painful. DO NOT TRIP THEM OVER ON PURPOSE! Okay? When they do, you go and comfort them immediately with a hug while pointing to the place that hurts. 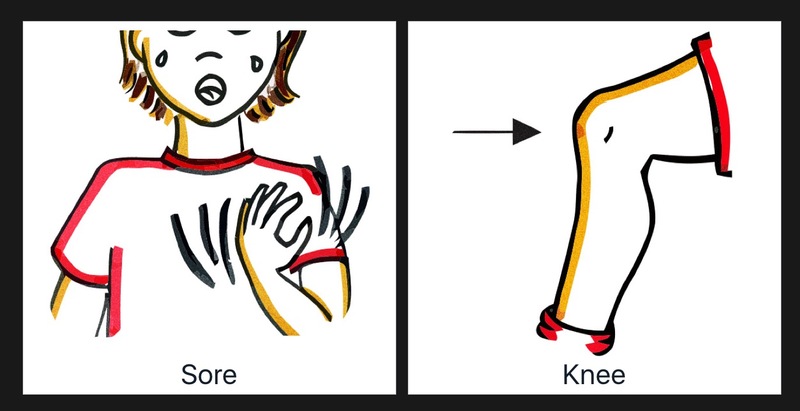 Say clearly “Sore knee” or “Sore Elbow, owie! This works really well with kids that are able to imitate speech. I did this with my son Liam who learned very quickly to repeat what I said, and to tell me whenever he was hurt. In fact Liam will demand an ambulance if he gets a hangnail. I encourage this because I know when he gets a tummy ache or an ear ache, he can tell me and we can go and see the Doctor before it gets worse. For non-speaking kids it is much harder. 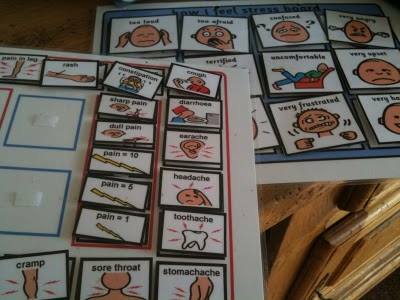 My daughter was a picture communicator from an early age and I struggled with teaching her to tell me when she was hurt using the same steps, so I made a visual “pain chart” with pecs pictures. As I said, you have to do this IN CONTEXT, when she actually feels the hurt. and the pain chart was a laminated A4 page with slightly gross pictures of body parts, too big to carry around. So, when she did get hurt I had to make a choice, do I run and comfort my daughter or do I try and find where I left the stupid pain chart? Gracie had a lot of anxiety and behavioural issues as a result of her autism. But sometimes I wondered whether it wasn’t just “autism” but a real pain like a toothache or earache. I had no way of knowing and it really tormented me. Until I created Grace App. And give them a lot of care and attention around that poor sore knee. Saying “Sore Knee” and pointing to the pictures and the actual knee, a lot. 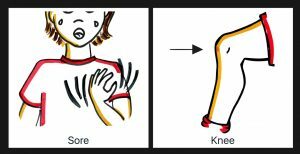 In a separate exercise; (when they are no longer in pain) you teach all the other body parts using flashcards or standard picture exchange requests. How do you request a body part? Try using our friend Mr Potato Head as a 3D teaching tool. Set up a mirror and the potato man and keep hold of the body parts. They can request “I want nose” and “I want eyes” using the phone. At the same time do a little “show me your eyes” and prompt a nice point at eyes looking in the mirror together. So it is real, not abstract. 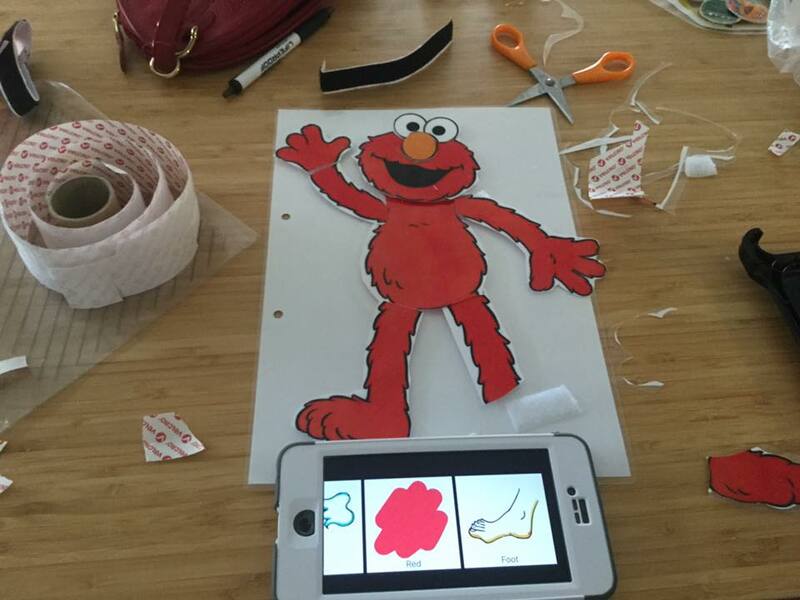 In school they make puzzles of her favourite characters and she requests each piece using the app. It is a great way to keep her interest while making sure she learns in context. My home made Elmo puzzle. Being able to describe pain and get relief is a basic human right. Unfortunately we do not prioritise it enough for the non-speaking and our health services need to address this. My goal is to make this easier, so that everyone regardless of whether they have a voice or not, is able to say how they feel.